Before I get to anything currently going on, I updated and revised my LSU-Georgia Series blog. Usually I only do this after games and it’s primarily to update the records, but it’s like a separate new blog this time. I hope you find the discussion of the last few close games between the two teams as interesting to read as it was to write. Best wishes to everyone dealing with the hurricane. As far as I can tell, no games for this weekend will be affected. As far as campuses of major programs, there may have been some damage to Florida St. The Seminoles happened to have a bye this weekend. Hopefully if there is any damage to the stadium, it can be remedied by the next home game. Auburn was affected by the storm system; but apparently there will be no impact on Saturday’s game. The intersection of Georgia, Alabama, and Florida is key recruiting ground for a number of programs including LSU and Georgia, so I’m sure there is a lot of interest and support in helping people get through this. With that out of the way, LSU was once again lucky (or is it unlucky?) enough to be chosen as the game of the week The Tigers do not tend to do as well at home during day games, but that may only be because they tend to play the better teams during the day. If you were curious, the Mississippi St. @ LSU game next week (regardless of the respective outcomes) will be the early evening game (7 eastern/4 pacific) on ESPN. The last SEC home game will be against Alabama in 3 weeks and will almost certainly be at night, so Georgia should be the only day game in Tiger Stadium this season. I gave the SECFans vlog another chance after not being too excited about their commentary against Florida last week. I also gave some more thought to what I wrote last week. At least that commentary game me a starting point, so I may listen to them more in the future to help give me ideas for writing. My feeling about the game is LSU has a chance to win, but it’s not the greater chance. I can see LSU winning by a touchdown or losing by a few touchdowns (or anywhere in between), so I think the two commentators picking LSU to lose by 7 and 10 respectively are decent picks. Both commentators in the video said Georgia was a better team and that LSU has a real chance to win, so I guess they abandoned the “LSU can’t beat better teams” line. First off, it’s hard to compare the results of the two teams since Georgia hasn’t really been tested by its opposition. South Carolina was the only team ranked (24th) at the time, and they’ve since lost to Kentucky before beating Missouri with a last-second field goal last week. LSU has played three teams better than South Carolina (U. Miami, Auburn, and Florida). Georgia has not yet played its apparent challengers for the SEC East crown Kentucky and Florida. Georgia has given up as much as 29 points, which they did on the road against Missouri. LSU is definitely a tougher place to play than Missouri, so even if there weren’t a talent gap between LSU and Missouri, that should be enough to make it a competitive game. The Bulldogs’ offense was responsible for only 36 of those points. 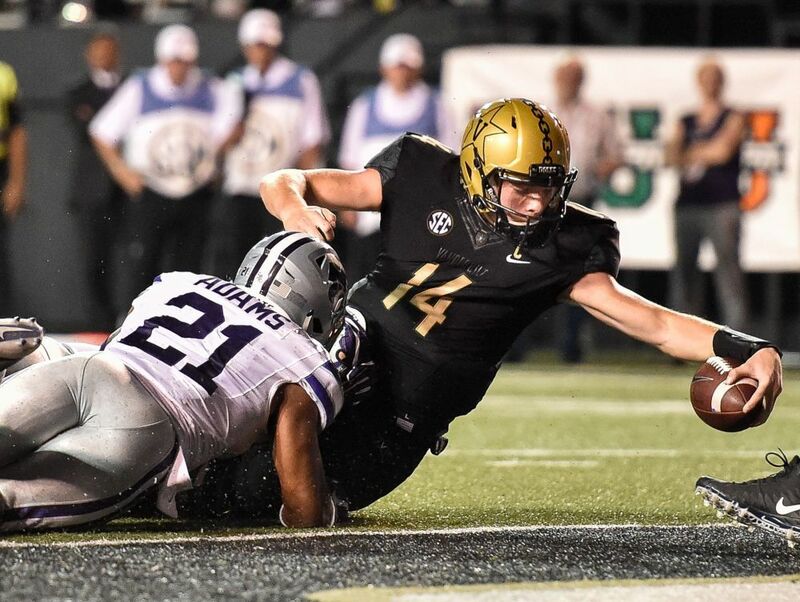 In addition to the fumble return for a touchdown, 3 other Georgia points resulted in part from a Missouri turnover. LSU does not have a passing offense like Missouri, but on the other hand they’re also not going to throw 25 incompletions, so I think that’s one Georgia game worth talking about. 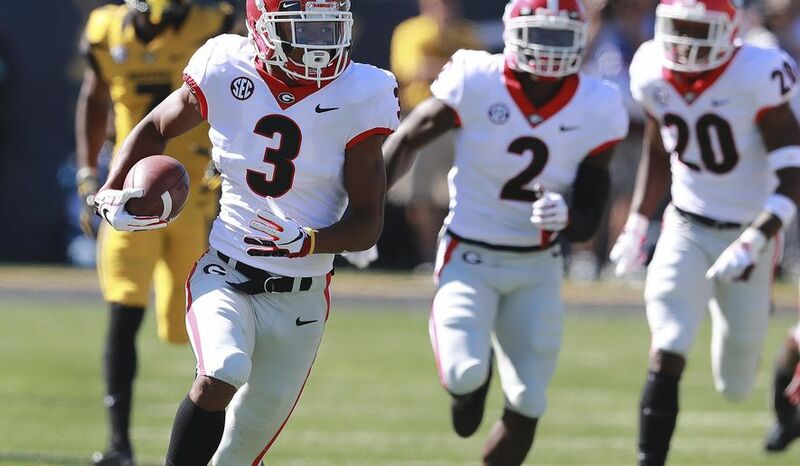 Part of the reason is that was the only Georgia game in which the outcome was in doubt well into the fourth quarter. Georgia DB Tyson Campbell returns a fumble for a touchdown at Missouri on September 22. The Bulldogs went on to win, 43-29. Although Mizzou threw the ball 48 times (partly because they were playing from behind almost the whole game), they still had a fairly good rush-pass balance. There was only a 50-yard difference between their total passing yards and total rushing yards. Mizzou also committed 3 turnovers which led to 10 points. If it weren’t for that, Mizzou may have been able to have even better run-pass balance. 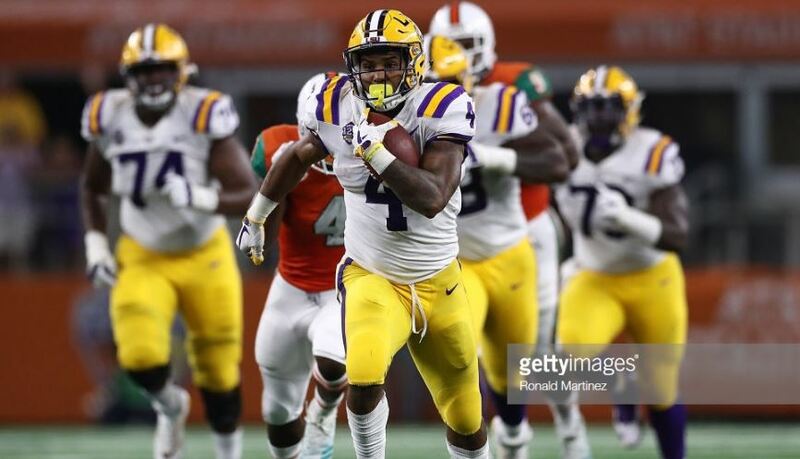 As I discussed in the LSU-Florida post-game, LSU is most likely undefeated if not for two key turnovers against the Gators; but in other games the Tigers won the turnover battle. So LSU might not have to be much better than a Missouri but just without the big mistakes Missouri had against Georgia or LSU had against Florida. Maybe LSU won’t sneak up on Georgia as much, but it’s not like against Missouri the Bulldogs had a hangover from Middle Tennessee the prior week or were really worried about hosting Tennessee the next week. As discussed in the video, Georgia only has an average performance against the rush. That gives LSU more of a chance than against a generic top-5 team. LSU did struggle somewhat against Florida’s rushing game, but the Gators had 15 more rushing attempts than passing attempts. Georgia is not that kind of team unless they’re trying to run the clock out. It doesn’t make sense for a team that averages about twice as many yards per pass as yards per rush to run the ball all the time. It does make some sense if your quarterback is Felipe Franks to run the ball a lot in a close game. Florida had more yards per pass than yards per rush but not by much; and when you’re more likely to throw an incompletion than a completion, passing kills drives. It’s no question that Georgia has a better quarterback than LSU, and I feel pretty sure that LSU has the better secondary, but I think the LSU and Georgia pass defenses are a lot more similar than the quarterbacks. The reason I think Georgia wins is even a well-defended Georgia will probably be able to contribute another scoring drive or two with its passing game. On the other hand, Burrow may be more comfortable if the running game is doing better and he doesn’t get sacked. Georgia does not have a very good pass rush. Like with LSU –Florida though, if the team that should win is in scoring position and turns the ball over in one drive and there is another drive that ends in a defensive score, I think that’s enough to tip the game the other way. I mentioned Missouri turned the ball over three times against Georgia, but Georgia had two turnovers. I think LSU is a team that is better at forcing turnovers than Missouri is, so LSU getting 3 turnovers is not out of the question. If LSU also has 3 turnovers, which they technically did against Florida (the interception at the end of the game doesn’t mean too much), I still think they lose though. There are two good field-goal kickers in this game and I sense a lot of effective third-down defense on both sides (Georgia was only 3/12 against Missouri; LSU was only 4/17 against Florida), so I’m thinking the final score will be something like 30-23 Georgia. I’ve discussed the LSU-Auburn series before. A lot of people don’t realize it was rarely played before the famous Earthquake Game in 1988. 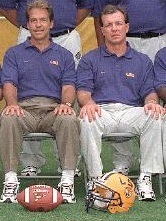 That’s one reason why when Auburn won in 1999 (the Cigar Game), it was only their third win in Baton Rouge in 60 years. Details of the interesting games before 2008 are in the link above. Auburn has won 12 of the 19 games in the series that have been played in Auburn. LSU has only won at Auburn twice since 1998, both against teams that finished with losing records. 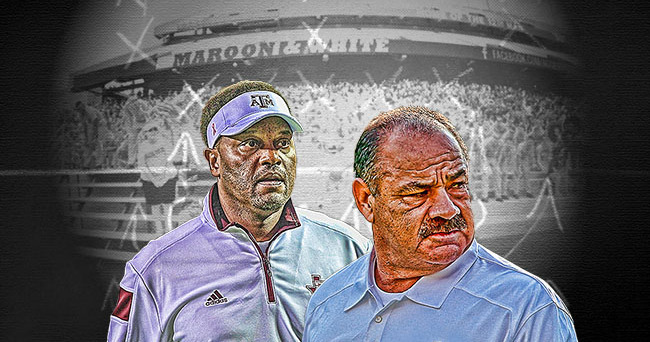 Those happened to be the last respective years that Tommy Tuberville (2008) and Gene Chizik (2012) coached there. LSU WR Stephen Sullivan dives into the end zone on 4th down to put the Fighting Tigers on the score board in Baton Rouge last year. LSU was about one second of clock management away from winning in their last trip to the Plains, and that was not only Les Miles’ last season but his last game. When this first became an annual series in 1992, it was typically the first SEC game for LSU; but this is a rare instance in which it is also the first SEC game for Auburn. From 2001 to 2011, the game was only played in September three times, but it seems September is going to return to being the default going forward. Two years ago, LSU was the more experienced team, and the Fighting Tigers (that’s how I will refer to LSU in this blog) lost. As I discussed in my preseason blog, this time the roles are reversed. It’s only a difference of 3 returning starters though. Although they were generally in Baton Rouge, I wanted to highlight some instances in which LSU has done relatively well against Auburn given the respective results of the teams for the season. One that was in Auburn that was a really good game was 2010. Both teams were undefeated going into that game, but the Fighting Tigers were only ranked #6 and the Plainsmen (how I will refer to Auburn) were #4. LSU would later lose to Arkansas, and Auburn would win out. 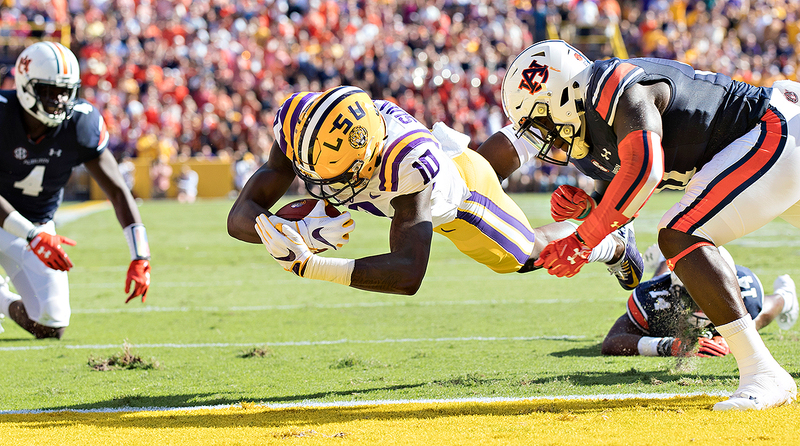 The game started disastrously for LSU as Auburn capitalized on a Jordan Jefferson interception in LSU’s opening drive and scored the game’s first touchdown on the ensuing drive. The score was 10-10 at the half though. 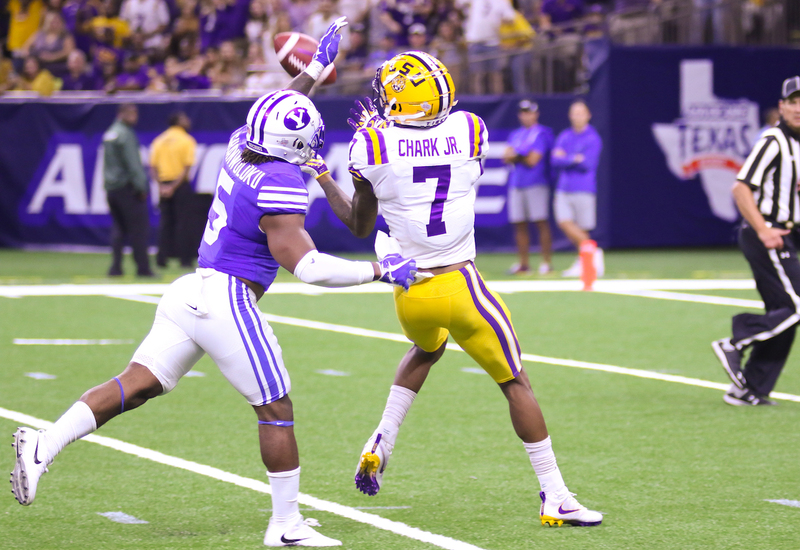 Especially given the start of the game, this seemed to be an advantage to LSU since the game was a battle between the top SEC offense and the top SEC defense, but the Fighting Tigers struggled even more offensively in the second half. Nonetheless, on a halfback pass by Spencer Ware, LSU was able to tie the game at 17 with 12:16 left. The LSU defense came through one more time when Auburn turned the ball over on downs at the LSU 40 with 7:51 left. The LSU 3-and-out that followed was just too much for the Fighting Tiger defense though. It only took 3 rushing plays (Newton 16 yards, Dyer 4 yards, and McCalebb 70 yards) for Auburn to drive 90 yards for the winning touchdown with 5:05 left. The Fighting Tigers were again unable to get a first down in the next possession, and the Plainsmen ran out the clock. When Auburn was 80 seconds away from the national championship Florida St. won in 2013, their only prior loss had been to LSU in Baton Rouge. It was only an upset in retrospect though, because Auburn was unranked going into the game, and LSU was #6. LSU led 21-0 at the half and was never seriously challenged. (This game is not to be confused with the 2015 game in which LSU lead 24-0 at the half.) LSU’s Jeremy Hill rushed for 184 yards (and other backs combined for another 51 yards), so even though Auburn got within a couple of possessions, losing 35-21, it was too easy for LSU to control the clock in the second half. LSU would finish 10-3. 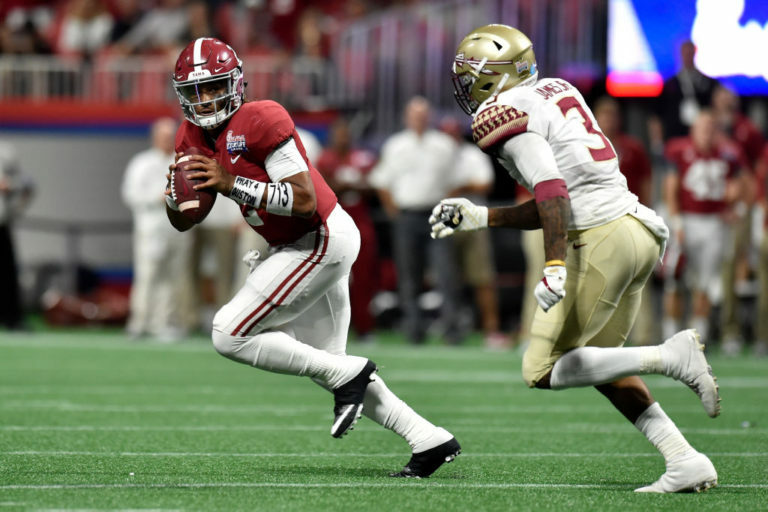 The Fighting Tigers would lose close games to Georgia and Ole Miss before Alabama pulled way in the last third of the game to beat them by 21. Auburn would advance to the SEC Championship game on the famous Kick Six against Alabama. Finally, last year, Auburn again got to represent the SEC West in the championship game after beating Alabama. Once again though, when you look back, the one regularly scheduled loss was against LSU. The Fighting Tigers had already lost to Mississippi St. and Troy (although looking back those two teams combined for 20 victories), and Auburn was undefeated and #10 in the country. This time it was the Auburn Tigers who scored the game’s first 20 points. If you don’t remember what happened next, feel free to see last year’s blog under the heading “LSU-Auburn Game Recap and Analysis”. I’m going to list the games since and including that 2010 national championship season for Auburn. LSU had won the prior 3 games and 6 of the last 9 in the series. In 4 of those 6 years LSU won the SEC West, and after 1 of those Auburn wins they won the SEC West. 2010 was the last year in which this game was basically (in hindsight) the SEC West championship game. 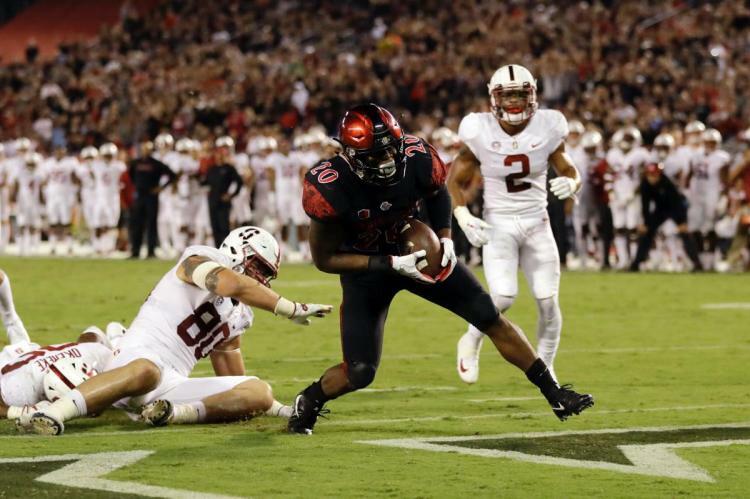 I will not make a habit of posting game previews on Saturday, but it just worked out that way this week. I didn’t look for pictures but may do so later. First of all, I want to make clear that South Florida (and possibly parts of North Florida, West Florida, South Georgia, etc.) are under very serious threat and nothing about Hurricane Irma should be taken lightly. But being that hurricanes are storm systems that move methodically and don’t shoot out death rays from hundreds of miles away, I do have some criticism over games that were canceled. I understand South Florida and Miami deciding not to play even though they had road games. There would have been too many distractions on Saturday, and there would have been legitimate concerns about the ability to go back after game activities without getting stuck. Preparing to make a couple of days’ trip for a football game and preparing to evacuate indefinitely are two very different things. 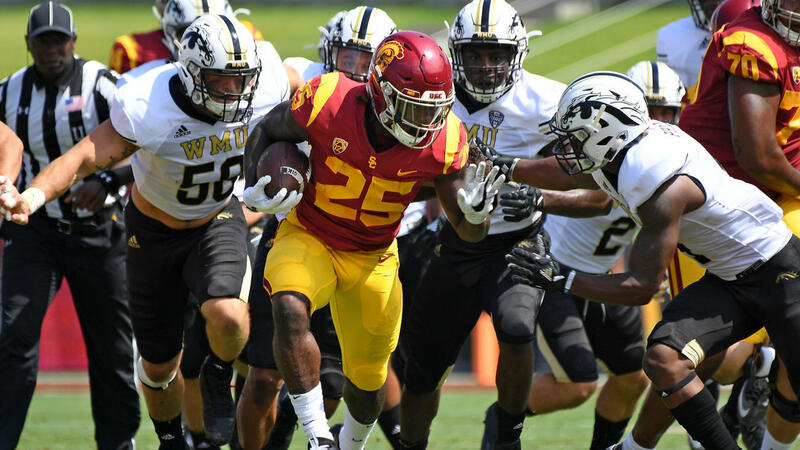 Maybe the two games could have been moved up to Friday if the decision had been made earlier in the week, but it’s hard to coordinate that with road games against opponents who aren’t used to hurricanes. I don’t think Florida and Florida St. needed to cancel their games though. I think they should have done what LSU did with the Appalachian St. game in 2008 and played the games in the early morning on Saturday (10:00 Central was early for me anyway, especially as a West Coast resident). The storm would have still been in Cuba at that time, and it would have allowed plenty of storm preparation to help out evacuees from other places. Along the same lines, I don’t know why it was necessary to cancel the Friday game in Orlando (Memphis @ Central Florida). Attendance might have been low with people having difficulty traveling or for whatever reason having more important matters to attend to, but make-up games often have low attendance anyway. Anyway, if there are hurricane-force winds in Gainesville, it would probably not be until Monday morning, even later in Tallahassee (if at all). 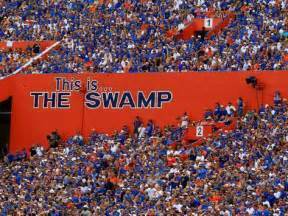 I know some of the players would have had family evacuating from South Florida, but South Floridians play at a large number of schools. I think the primary concern should be for the teams whose campuses were under immediate threat. Florida International, which is in the Miami area, managed to host a game on Friday, which makes it even more baffling to me that Central Florida canceled their game. FIU beat Alcorn St. 17-10 if you were curious. Maybe FIU has more sense because they have an international hurricane research center on campus. Also, Florida Atlantic, which is in Boca Raton (North of Miami), is playing @Wisconsin now (Wisconsin will win, but it was surprisingly competitive). 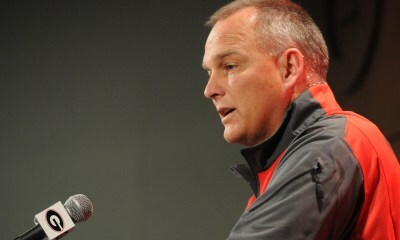 Another possibility is that the road teams who were traveling to Florida got nervous, but I hope that wasn’t the case. I would think someone could have explained that although circular winds in this one have been 160 mph or more within the last day a hurricane isn’t going to suddenly start moving across the map at such a speed. I’m pretty sure people in Monroe understood that, but I’m less sure about whatever city Northern Colorado is in. Another LSU memory I have is of 2005 when LSU didn’t play Tennessee until Monday night because Hurricane Rita was too close for Tennessee and its fans even though that Saturday in Baton Rouge was just a normal fall evening. Rita was a very destructive storm, just not for Baton Rouge and not on Saturday. 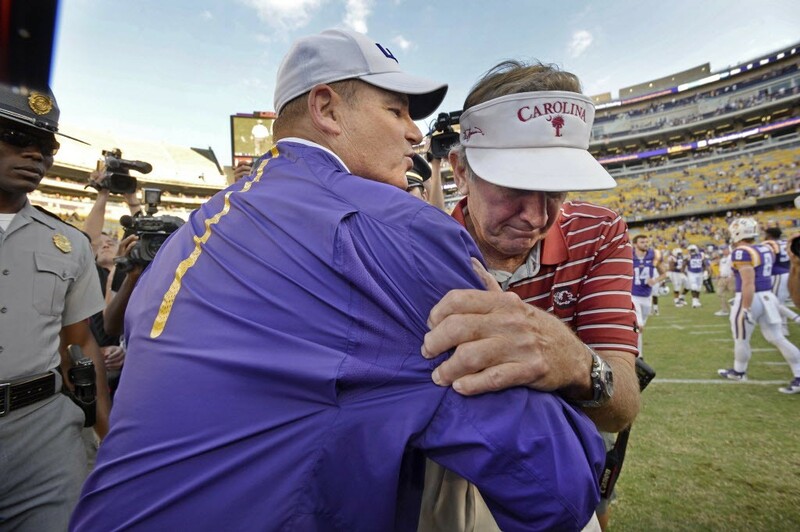 That game was also notable because it was Les Miles’ first SEC game at LSU. I’d rather not recall the game itself. One good thing is that other than Central Florida, none of the games were conference games. Those can cause all kinds of issues later in the year. As you might recall, the SEC had to threaten Florida’s possible berth in the SEC championship (which they eventually earned) before the Gators finally decided to play LSU last year. Anyway, I did want to talk a little bit about the games that will be played. As I mentioned above, the conference games are the most important, and there is an SEC game between residents of the two “Columbias” (South Carolina and Missouri). I decided that instead of picking all games involving SEC teams, I would just do the conference games and maybe a few extras in weeks with few conference games. So in this game, I’m picking South Carolina +3. I just don’t think Missouri is very good despite all the points they scored last week. They scored 61 against Eastern Michigan last year but lost to South Carolina by 10. I don’t see why the same sort of scenario is less realistic this year. 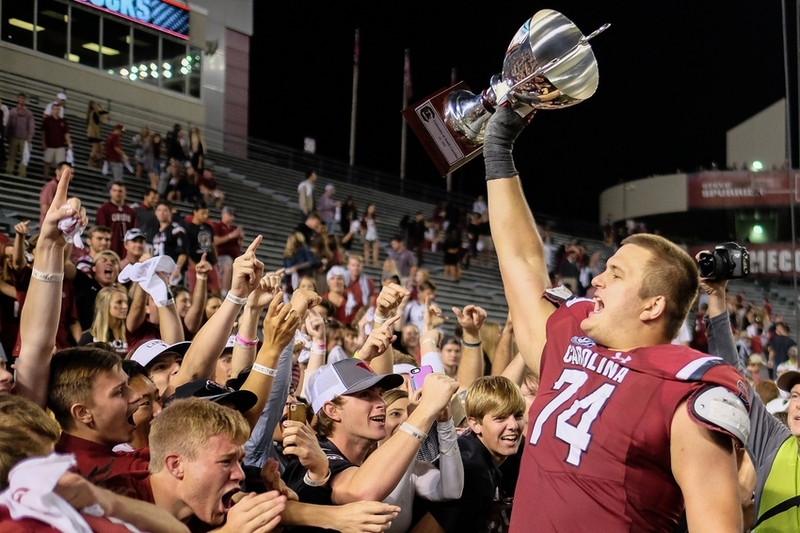 Offensive lineman Mason Zandi hoists the “Columbia Cup” after last year’s game. Clemson isn’t in the SEC obviously, but they’re playing Auburn. Clemson won by 6 last year with the best team they’ve had in over 30 years and Auburn was relatively mediocre. So I’m taking Auburn and 5. Auburn might even win, but if they don’t, I can easily see them losing by 3 or 4 and not more. Somehow Notre Dame is favored by 5 over Georgia. I think if anything Georgia will outperform expectations. Notre Dame’s expectations seem to be unjustifiably positive as usual, so I’m taking Georgia and the points there. I guess I’ll go against the SEC in the early game of interest, which is TCU (-3) @ Arkansas. Arkansas has started slow a few times in recent years. I think TCU has more of the pieces in place even though I think Kenny Hill probably has a lower ceiling than some of the other quarterbacks in the Big XII alone, but he had a pretty good game in the early going in 2014 against an SEC team (Texas A&M @ South Carolina). Not saying he’ll pass for over 500 yards, just enough to win by 3 or more. I’m not going to pick any more games against the spread, but there was another early game I’m very eager to follow, which is Pitt at Penn St. It was a great finish last year and probably kept the Nittany Lions out of the playoff in hindsight. A few other big evening games I haven’t mentioned: Oklahoma @ Ohio St. (two of my top 4, hopefully better than Alabama/Florida St. game), Stanford @ USC (the Trojans were underwhelming last week, but maybe WMU is good), and Boise St. @ Washington St. (I’d take the over, although both struggled offensively in the last couple of games last season).